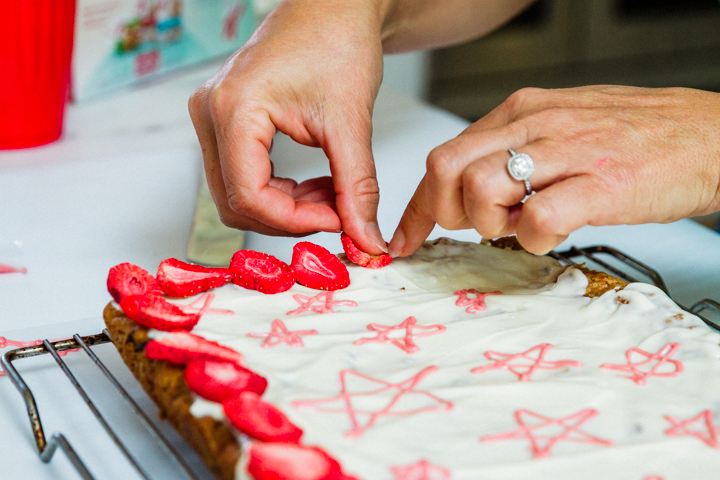 I whipped up some easy Strawberry Cornflake Bars for ya this July 4th. 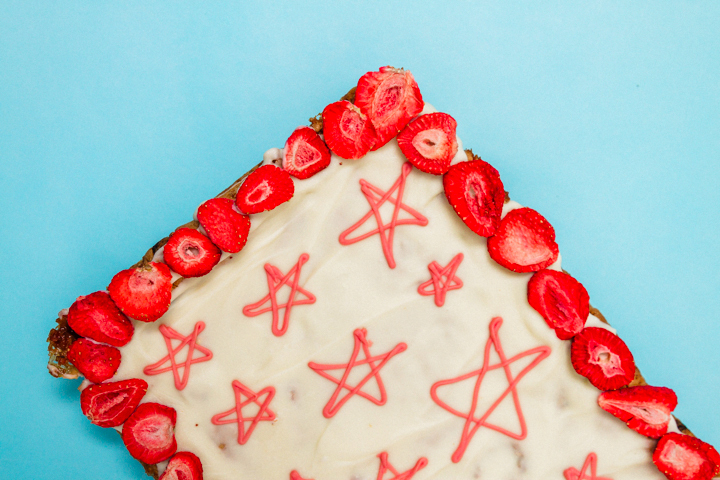 Thanks to Christina Tosi of Milk Bar for this cornflake cookie recipe, which I modified to a bar and decorated to fit the season of fireworks and patriotism. The bars crunch like a rice krispie, and contains strawberries, cornflake cereal and marshmallows. Want more goodies for Independence Day? Look no further. Mix the dough according to the recipe. Mind that Christina’s recipe makes 2 9×12 pans, so either make a bunch or freeze for later. Make sure to refrigerate the dough for at least and hour or it won’t hold its shape! 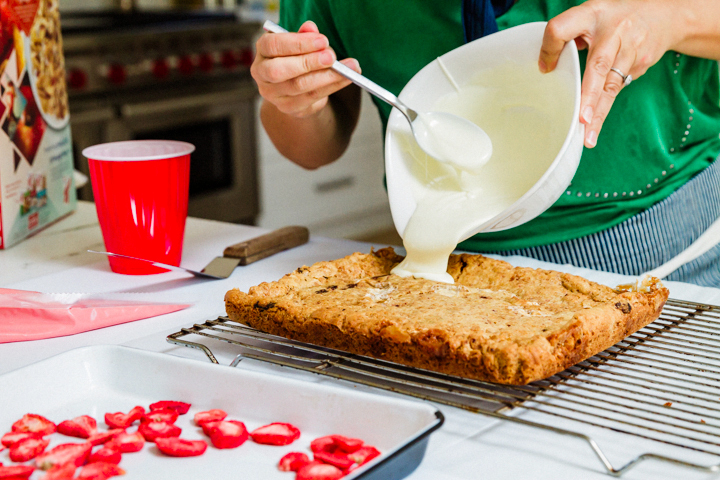 Press dough into a 9×12 pan lined with parchment paper. 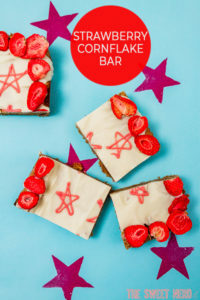 After you stick it in the oven, keep your eye on this puppy because it’s very easy to over bake these strawberry cornflake bars – trust me! Melt white chocolate to cover the entire bar. Decorate with stars in red/pink color. 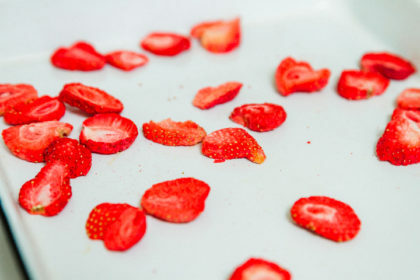 Add a border of dried strawberries. Melt the white chocolate melts and pour over cooled bar. Get the dried strawberries ready for the border (the original recipe calls for chocolate chips and I replaced with dried strawberries). 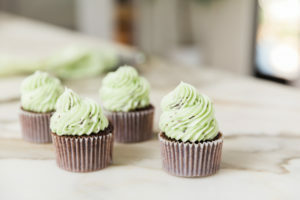 Fill a piping bag with melting chocolate for the stars. 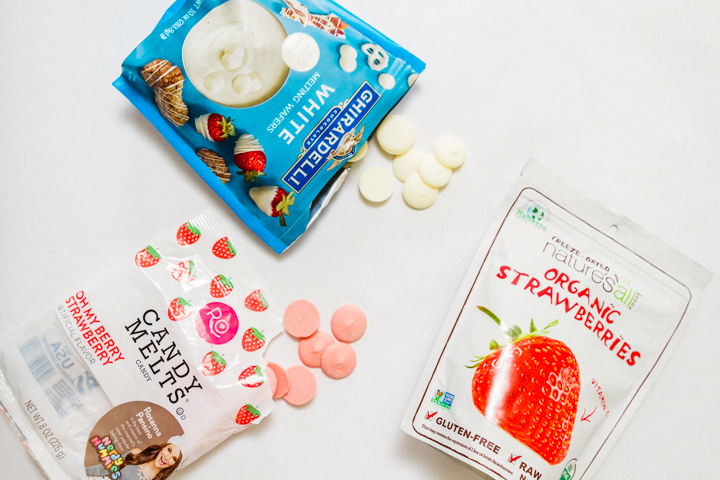 Here are two approaches to the coloring: buy white chocolate melts and adjust with candy coloring. 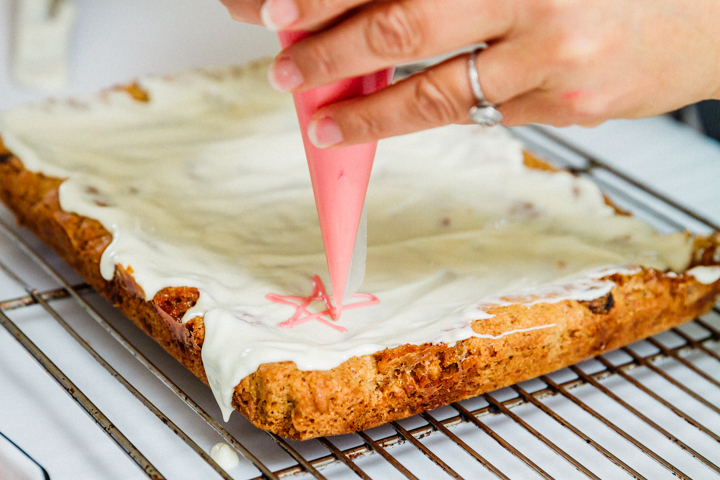 Or, you can use white and pink/red melts. I like Nerdy Nummies candy melts in “oh my berry strawberry” flavor. Line the border with strawberries and there you have it! 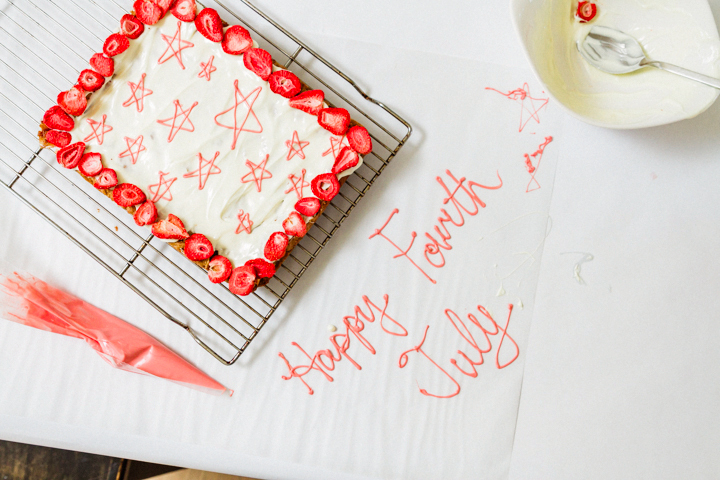 Strawberry cornflake bars: an easy, festive treat for the Fourth. 1Combine brown and white sugar with butter in the bowl of a stand mixer with a paddle attachment. 2Cream sugars and butter together on medium-high for 2-3 minutes. 3Scrape down the sides of the bowl. 4With the mixer on low, add your egg and vanilla. 5Beat for another 7-8 minutes on medium-high. The 7-8 minutes is totally worth it and important. The batter will be so light and fluffy. Almost like frosting! 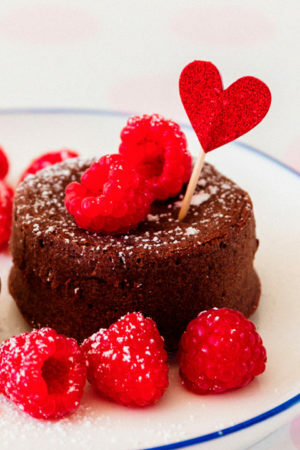 6While your sugar and butter is beating, combine your flour with baking powder, baking soda and salt in a small bowl. 7Reduce mixer speed to low and add your flour mixture. Mix until just combined. Do not over mix. You shouldn’t mix for more than 1 minute. 9Next add in 3 cups of Cornflake Crunch. Mix again until just incorporated. Do not over mix. 10Finally, mix in your mini marshmallows until just incorporated. 11Cover bowl with saran wrap and refrigerate for at least 1 hour and up to 1 week. Do NOT bake your cookies from room temperature. They will not hold their shape and bake into a puddle of crispy nothing. 12Cut dough in half as this batch makes two 9x12 pans. 13Place a piece of parchment paper in your pan and then press the dough down evenly using your palms. 14Bake in a 375 degree fahrenheit oven for anywhere between 12-15 minutes, until the cookie bar edges become golden brown and it begins to brown toward the centre. 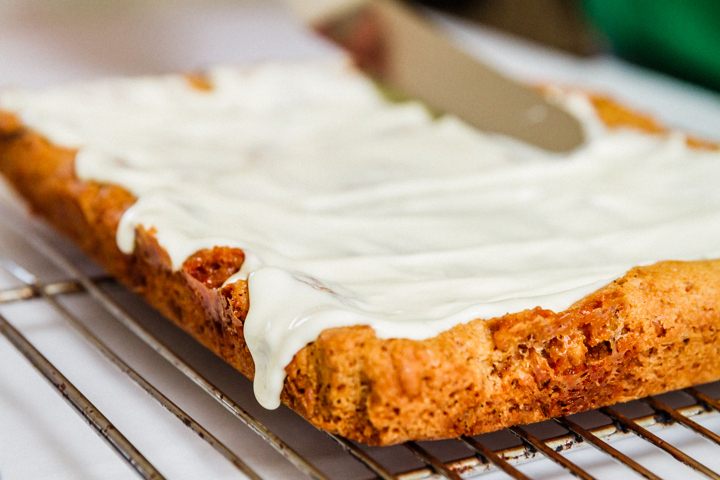 You NEED to keep an eye on these cookie bars. 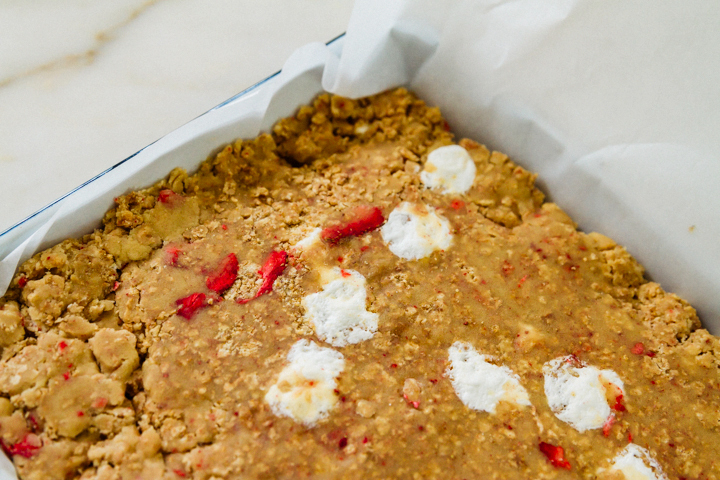 It’s very easy to over-bake these bars, so keep an eye on them in the oven. 15Cool bar completely on the sheet pants before transferring to an air tight container. 2Microwave white chocolate melts according to the instructions on the bag. Reserve 1/4th of the melted white chocolate for the red stars. Add 2-3 drops of red candy food coloring. * (Or, if you can use Nerdy Nummy Oh My Berry Strawberry Discs). 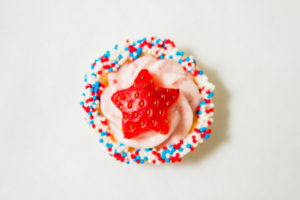 Mix and then pour into 1 piping or ziploc bag for star decorating. Slit the corner of the bag so you can have a skinny stream of chocolate to use for the star-decorating. Set aside for one minute until you are ready to decorate the stars. Work quickly now! 3Pour the rest of the white melted chocolate (I like Ghiradeli white chocolate melts) atop the bar and spread across evenly all the way to the ends. Place decorative dried strawberry border, and then finish decorating with star shapes atop the white chocolate layer. 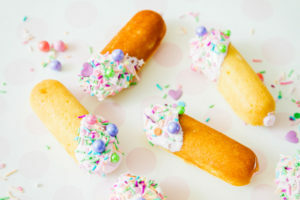 What a fun dessert for the holiday. I have a box of cornflakes in the pantry and just picked fresh berries that I am trying to figure out how to eat them all. Thanks for the recipe. Well there you go! Have at it. Let me know how it goes! Thanks Amy – they turned out as good as they look. Wow, this is interesting! The Milk Bar is always coming up with awesome combinations, I’m glad that they can be replicated well at home! I agree, I have a few recipes on the blog I’ve borrowed from Milk Bar, and tweaked just a little to fit my needs. Loving the stars on top! So cute for 4th of July! Oh my goodness, I know everyone will love this dessert and will fight over the edges because they are going to want those dried strawberries. This is perfect for the 4th!! Debra, you nailed it. Those dried strawberries are the best. This sounds like such a delicious idea! I love Rosanna pansino and it’s so cool she has her own baking line now. That’s definitely #goals!! I agree – she’s just the cutest. Nerdy Nummies is such a cute product line.